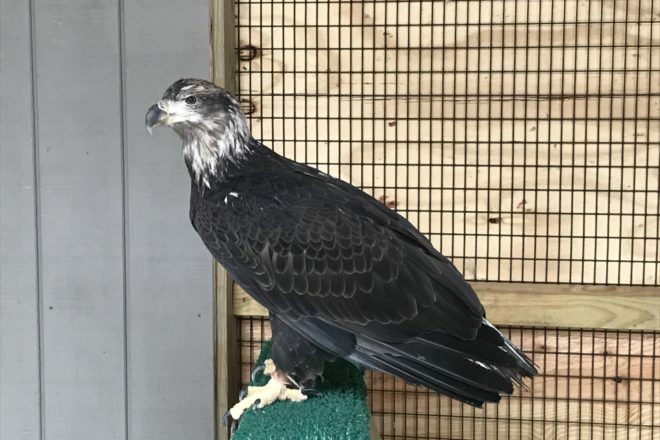 The Open Door Bird Sanctuary (ODBS) is now home to a Wisconsin-born bald eagle named Fisher that will greatly enhance the sanctuary’s educational programming. He is the 14th avian resident, joining hawks, owls, falcons and a turkey vulture. At about three years old, he still has the overall brown coloring of juvenile eagles. He was named after Walt Fisher, an early ODBS supporter and board member who died in August 2018. “We think it will be fun for our visitors to see Fisher go through his color changes over the next couple years as he becomes an adult,” said Rob Hults, ODBS’s executive director and director of avian training. Open Door worked for two years to obtain Fisher through grassroots efforts, fundraising and a grant from Cellcom to construct a new enclosure, obtain the required U.S. Fish and Wildlife Service permit and find a bald eagle. As a very young bird, Fisher was found with permanent wing damage on the ground below his nest. He could not be released into the wild because he couldn’t hunt, but he had remained essentially wild because he’d been a socialization bird at another facility, helping to prepare other eagles for release. Open Door was founded in 2010 to provide lifetime homes for unreleasable birds of prey that become inspirational and educational ambassadors of the environment for students and the public. The 34-acre ODBS site – located on County I near Jacksonport – includes three hiking trails and multiple areas for viewing birds.